Kitami, Saga, and Matsumoto’s article looks at psychological factors, going beyond the usual factors of genre and console, that go into consumers’ purchases of video games. The authors begin by constructing “a purchase factor model using Structural Equation Modeling (SEM), which [they] use [to] analyze the influences of factors quantitatively” in an effort “to clarify the latent purchase factors of Japanese consumers” (p. 286). 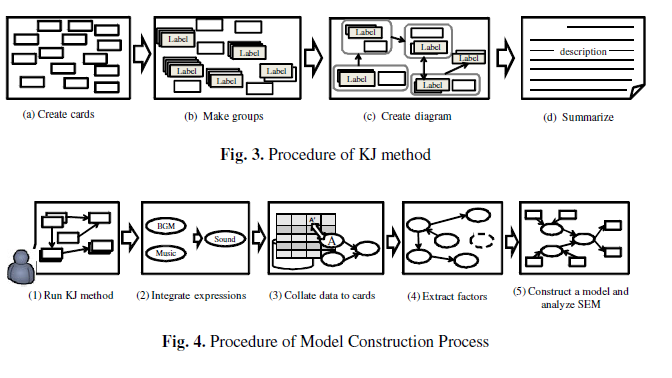 They also mention that, while constructing the SEM, they attempted to avoid the subjective nature inherent in constructed models by proposing “a factor model construction process that uses KJ method,” claiming that, with this method, they “can perform a comparison analysis of Japanese and American consumers’ purchase factors in order to develop a game that will be a best-seller in both countries” (p. 286). The authors state that the KJ method, “developed by J. Kawakita in 1951,” has four steps: “1) Create cards: Establishing a theme and writing ideas and facts related to theme; 2) Make groups: Grouping related cards and labeling groups; 3) Create diagram: Arranging the labeled groups according to directions for casual relationships; and 4) Summarize: Synthesizing the meaning of the completed diagram via text” (p. 288). The authors then break the rest of their article into four sections: 1) “the transition and characteristics of the Japanese and American game industries,” 2) “the creativity technique and proposed process,” 3) a description of the “environments and results of the experiment,” and 4) a discussion of the results. Figure of the process used by Kitami, Saga, and Matsumoto. Located on page 289. For their experiment, the three authors “formed three Japanese groups and three American group…[and] asked these groups to form KJ method, construct six factor models, and analyze purchase factors,” which they then used to “compare the differences in psychological factors between Japanese and American consumers, with their future focus being on university students (p. 289). The authors record that they collected data on 1083 video digital games, “which were evaluated by consumers on the user review site ‘PlayStation mk2’ to analyze purchase factors of Japanese consumers [using] 16 parameters (platform, maker, genre, price, rating (target age), userrank (game rank), playnum (number of players), median (comprehensive evaluation), reviews (number of reviews), originality, sound, excite, amenity, graphics, satisfaction, and difficulty)” (p. 290). And they “collected data on 5764 video games on the user review site ‘IGN Entertainment Games’ to analyze purchase factors of American consumers…[using] 11 parameters (genre, publisher, month (release month), price, platform, rating, graphics, sound, gameplay, lasting appeal, and overall)” (p. 290). The authors concluded that “Game content has a large influence on consumers purchase motivation in both countries; Japanese consumers have strong brand consciousness and conservativeness; Japanese consumers have little consideration for genre and platform; Series information and games expansion strongly affect American consumers’ purchase behavior and overall evaluation; and American consumers prefer education games and games involving physical activity to other games” (p. 293). I was really excited when I found this article because I was expecting the authors to really hash out the differences in Japanese and American consumers’ values and beliefs that affect the kinds of games that they purchase, which would help me think about the localization efforts of the PlayStation 4 campaign advertisements. However, this text has so many flaws that I am now looking at it for what not to do in the future. The authors left so many gaps in their explanation of their study, leaving me wondering how they chose the three groups of Japanese video game consumers and three groups of American consumers? How many people were in each group? Were these people biased towards different genres? How were they chosen? I also questioned their data collection about video games, as there is a huge difference between collecting data on 1038 games to analyze purchase factors of Japanese consumers and collecting data on 5764 games to analyze purchase factors of American consumers. Why the difference in parameters used for analysis? How did they choose which parameters for each of the countries? And then there is the issue of the sales ratios of video games genres (see below), where the genres are mostly different. Unlike the image of these two countries’ video game markets, both countries’ video game industries have quite a market for all of the genres listed on both pie charts. The family entertainment that is listed so firmly in the American market is predominately from the Nintendo games, with many of them being developed by Japanese studios. And as someone who is a huge role-playing game fan and deeply aware of the culture that surrounds such games, I am deeply wary of that genre not being listed as one of the main genres for the American market. I am not quite sure how the authors really broke down their data to come up with such results, though I am curious about the SEM and KJ method they used, but their study raised more questions than could ever be answered by their text. However, I may be speaking from a staunch source of gaming bias and ruffled RPG feathers. Kitami, Saga, and Matsumoto included two figures breaking down popular genres in Japanese and American video game markets, respectively. Located on page 287.